Quebec is on the way to adopting proportional representation for their 2022 election. On May 9, 2018, four opposition parties – Parti Québécois, de la Coalition Avenir Québec (CAQ), de Québec solidaire and Parti Vert du Québec – signed an agreement (in English here) to introduce legislation for Mixed Member Proportional Representation by October 2019. Watch the press conference in the video at the top of the page. The only party opposed to this change are the Quebec Liberals. In October, 2018, the CAQ won a false majority government with 37% of the vote. Premier François Legault has reaffirmed his commitment to implement proportional representation, stating after his election, “We will not do a Justin” (referring to Justin Trudeau’s broken promise on electoral reform) and “the Liberals do not have a veto.” The parties who are signatories to the agreement collectively represent 71% of voters and hold 74% of seats in the Quebec Assembly. Legislation for proportional representation is expected by October, 2019. This groundbreaking progress in Quebec has been facilitated by Mouvement pour une démocratie nouvelle (MDN). MDN is an ally of Fair Vote Canada. To get involved in their campaign, please visit their website here! 1964: Rassemblement pour l’indépendance nationale (RIN) (Rally for National Independence), the first party to come out in favour of proportional representation in their Manifesto. 1976: Parti québécois elected. Reform has been a part of its platform since 1968. 1984: The Electoral Representation Commission (an agency that reports to the Chief Electoral Officer of Quebec) tabled a report recommending that the first-past-the-post system be replaced by a voting system that would allow all Members to be elected proportionally. René Lévesque failed to convince his caucus. 1998: Another wrong winner election. 1999: Mouvement pour une démocratie nouvelle (MDN) (Movement for a New Democracy) is founded. 2002: Quebec Government published a discussion paper in October 2002 on The Reform of the Voting System in Quebec. 2002-2003: Estates General on the Reform of Democratic Institutions (the Béland Commission) visited 20 towns in Quebec and held 27 public hearings. They voted, by a 90% vote of those 825 people, for proportional representation. Their preferred model was Mixed Member Proportional. In March 2003 they presented their Report. In July 2003 the new government of Jean Charest began work on a mixed member system, aided by the 140-page Report of Prof. Louis Massicotte. 2004: The Quebec government presented a draft bill proposing an MMP system with very small regions. The 127 Members of the National Assembly (MNAs) would be 77 members elected locally, and 50 in “top-up” regions. The regions would mostly comprise only five MNAs each: three constituencies and two regional seats. Voters would still cast only one vote. The candidate with the most votes in the local riding would be elected, as is currently the case. The remaining regional seats would be awarded to under-represented parties. 2005-2006: A Select Committee of the National Assembly began proceedings in November 2005, and sat jointly with a randomly selected Citizens’ Committee. They were to study and make recommendations on the draft bill introduced in December 2004. They held public consultations in 16 cities across Quebec. In April 2006 the Citizen’s Committee presented to the National Assembly a detailed report in which it rejected the government bill and proposed a MMP system similar to that used in Germany, with a two-vote system. The Citizens’ Committee faulted the bill particularly for proposing very small regions with high thresholds which would not accurately reflect the popular vote, and a single-vote system that would perpetuate the practice of strategic voting. 2007: The Report of Quebec’s Chief Electoral Officer on a compensatory mixed system was made public. It reviewed a number of options for the design of a mixed proportional model for Quebec, leaning towards a nine-region model with an open list system giving voters the choice of using their second ballot to vote for a party or one regional candidate. 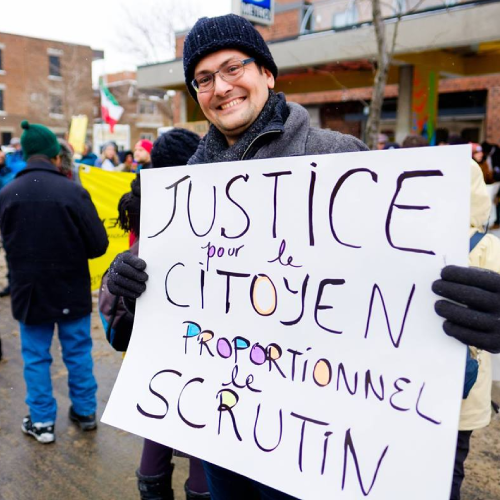 Electoral reform is abandoned due to opposition from the PLQ (Quebec Liberal Party) caucus and municipal councilors. May 2018: Following the efforts of MDN to bring together civil society groups and opposition parties, all opposition parties sign an agreement committing to drafting legislation in the year following the election of Oct. 1, 2018. October 2018: CAQ elected to a false majority government. Repeats commitment to introduce a bill for proportional representation by October, 2019. -Contribute to a better representation of women, youth and ethnocultural communities.